Our Cheese of the week is Wigmore – named after Ann Wigmore who makes the cheese, it is a traditional hand-made washed curd cheese made from unpasteurised ewe’s milk. This semi-soft cheese has been described by cheese guru Juliet Harbutt as a “taste sensation of wild flowers, burnt caramel, macadamia nuts and roast lamb”. 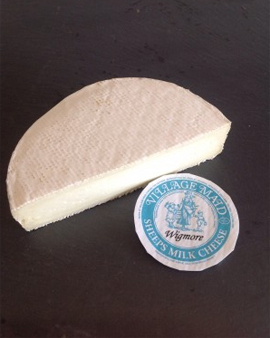 Wigmore cheese is matured for six weeks with a white rind and is available in 800g and 400g cheeses. Winner of numerous Gold awards, it was developed by Anne after undertaking trials for nearly a year.